Epidemiological studies have been a really important source of our knowledge on the risk factors and causes of cancer. In particular, large prospective cohort studies, in which healthy people are surveyed and then followed up for many years, continue to be a powerful tool in looking for associations between various lifestyle factors and different diseases – including cancer. However, there is increasing evidence that molecular differences between different cancer types may be really important in understanding how they develop. One of the limitations of many epidemiological studies is that they often have little or no information on these molecular aspects of different cancer types. 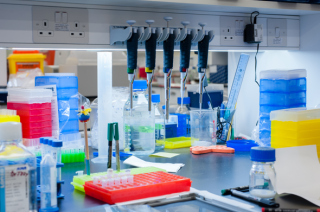 Kezia has received funding to conduct a pilot study of retrieving archival linked tumour tissue samples from women with certain cancer types within a large UK cohort study. The aim of this initial study is to establish the feasibility of identifying and using such samples. The ultimate goal would be to expand this to the rest of the cohort, enabling large-scale epidemiological analyses on molecularly characterised tumour samples. This could aid the understanding of how various risk factors relate to specific cancer types. Image copyright:Oxford University Images/ Nasir Hamid - All rights reserved.